The fight against Boko Haram in northern Cameroon propelled Cameroon's security forces as heroes and patriots, including elements of the Rapid Intervention Battalion (known by its French acronym B.I.R) - a battalion that inspires fear and evokes memories of intimidation and abuse among numerous Cameroonian civilians. Despite their fearsome reputation, Cameroon's armed forces now enjoy the support of the same civilians who have suffered human rights violations in one way or the other in the hands of soldiers either during peaceful protests or normal day-to-day interactions. Cameroonians with fresh, long memories, however, support the army with caution. Nigeria's Boko Haram terrorists have, in recent months, carried out cross-border attacks in towns in northern Cameroon. 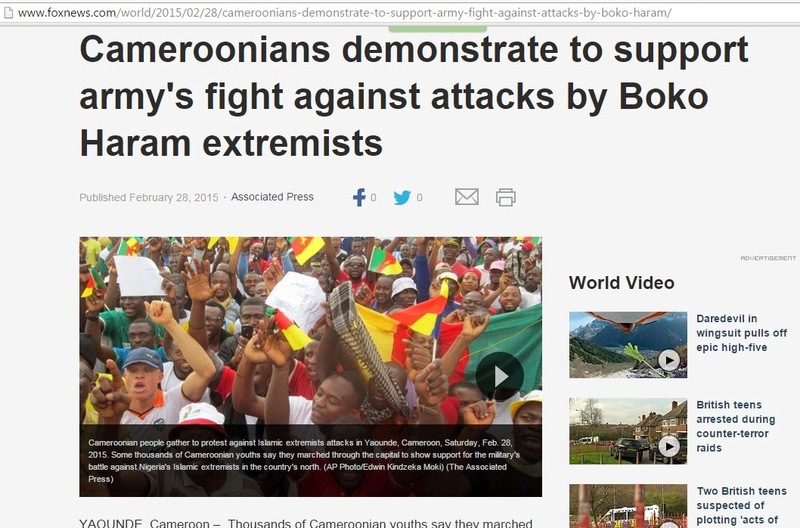 According to a report by The World Street Journal, Cameroon has become the terror group's second front and many Cameroonians have fled their homes. Cameroon's security forces are fighting back and many soldiers have lost their lives. Thousands of people marched in Yaounde on 28 February 2015 in protest against Boko Haram and at the same time to show solidarity with the army, according to Reuters. The demonstrators marched carrying flags and placards praising the army. There was also a march in the economic capital Douala. In an unusual show of support, Cameroonian civilians identified themselves as the army - the same army that intimidates them and violates their right to assemble and protest against a regime that has been in power for over 30 years with little to show for it. Images of coffins of fallen soldiers draped with the national flag of a relatively very peaceful country shocked the nation. The images evoked emotions and won the hearts of many in favor of the army. Many Cameroonians have never experienced war or an armed conflict hence the thought of war with Boko Haram is terrifying. But Cameroon's security forces charged with defending the nation should not be given a blank check. The army must uphold human rights standards. Cameroon's security forces have a poor record in terms of human rights, and reports of violations keep pouring in as the security forces battle Boko Haram. According to Amnesty International's 2014/15 annual report (see page 95), which was released three days before thousands of people took to the streets of Yaounde to show support for the army, Cameroon's security forces including the B.I.R were responsible for human rights violations such as killings, extrajudicial executions, enforced disappearances, arbitrary arrests and illegal detentions. Most of the violations were committed in the fight against Boko Haram. Amnesty reports that a nurse, Nzouane Clair Rene, was shot dead following arrest by armed security forces near the town of Mora in northern Cameroon. On the same day, two traders identified as Ousmane Njibrine and Grema Abakar traveling to a village market were allegedly killed by the B.I.R in Dabanga. Other people allegedly killed by the B.I.R include, Malloum Abba, Oumate Kola and Boukar Madjo. According to Amnesty International members of the B.I.R were also reportedly involved in enforced disappearances. Abakar Kamsouloum for example was reportedly arrested at his home in Kouseeri on 2 June 2014 and transferred to a military camp. His fate and whereabouts, according to Amnesty, remained unknown at the end of the year. As a Cameroonian, I'm familiar with the way Cameroon's security forces operate. They're brutal and have little or no regard for human rights and the law. In fact, when I first heard about the B.I.R when I traveled to the country in 2010, I thought the battalion was referred to as "bee" -- due to their stinging reputation. It took some time before I realized that the acronym is "B.I.R" not "bee". Reports of human rights violations allegedly committed by them in the context of fighting terrorism are plausible. The B.I.R, in my experience, inspire fear and intimidate civilians in peacetime. Their conduct in a war-like situation would definitely leave a lot to be desired from a human rights perspective. I've heard stories of people brutalized and intimidated by members of the B.I.R, many of whom believe are above the law. The brutality and heavy-handedness of Cameroon's security forces, including police and soldiers is no secret. In 2008 for instance police and soldiers clashed with civilians in several towns and cities. Cameroon activists said over 100 people were killed. It's therefore surprising to see many Cameroonians at home and abroad herald the phrase "Je suis l'armée camerounaise" (roughly translated it means "I am the Cameroonian army") -- borrowed from the famous online French campaign, "Je suis Charlie." The march to show support for the army - a march which ironically would've been suppressed otherwise by security forces if it had a different theme - was, in my perspective, inspired by the adage that the enemy of my enemy is my friend. Boko Haram is the enemy of the state (the army) and enemy of the people. The people therefore felt compelled to forge a rare friendship with the army because they (the people and the army) have a common enemy in Boko Haram. But before the advent of Boko Haram Cameroon's security forces treated the people they now protect like the enemy - intimidating, brutalizing, unlawfully detaining and sometimes killing them. It remains to be seen whether or not the new-found "solidarity" between the army and the people - as demonstrated in the 28 February march - will endure. I don't think it will. The army will enthusiastically repress the people the next time it's deployed to do so. When the time comes, the phrase "Je suis l'armée camerounaise" won't be heard. The people will be saying: "Je ne suis pas l'armée camerounaise." Personally, I abhor terrorism and deplore acts of terror in Fotokol, Chibok, Paris, Garissa or elsewhere in the world. But I'm not (in support of) an army that intimidates civilians and violates human rights. You forgot to mention , food and beer prices were increased to fund this fight and the people accepted. . the military is doing what it was created to do and Cameroonians for the sake of motherland will always stand by them. The debate of abuse and human rights violations can come later.. For now we fight and bury our sons and daughters in a fight that's not even ours.